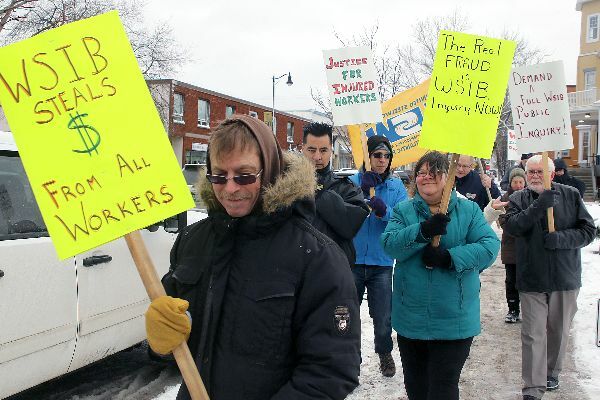 About a dozen injured workers and their supporters marched to Liberal MPP Michael Gravelle’s office on Monday to protest WSIB practices. (Canadian OH&S News) — A Hamilton, Ont. doctor has filed a lawsuit against the Workplace Safety and Insurance Board (WSIB) and her former employer, Workplace Health & Cost Solutions (WHCS) in Vaughan, for wrongful dismissal from the latter — claiming that the former tried to force her to change her medical opinion about an injured worker, before pressuring the latter to fire her. According to a Statement of Claim provided to COHSN and dated July 31, Dr. Brenda Steinnagel, 50, is seeking more than $1.3 million in damages from the WSIB and more than $1.8 million from WHCS, plus a declaration that the latter fired her wrongfully in April. WHCS assigned Dr. Steinnagel to review the workers’ compensation claim of a hospital security guard who had suffered a head injury while restraining a patient late last year, the court document says. But Dr. Steinnagel, who had worked for the company since Sept. 2012, claims that WHCS opposed her medical opinion of the worker’s condition and even tried to “coerce” her into signing a statement that contradicted her conclusions. For several months, both WHCS and the WSIB allegedly waged “a relentless campaign” to make her alter her conclusions, but she refused to take part in the fraud, the Statement of Claim notes. “She gave an opinion and was fired for reaching the wrong opinion from their perspective,” explained Mark Polley, Dr. Steinnagel’s lawyer, a partner with law firm Polley Faith in Toronto. “It’s a pretty outrageous situation, to be fired for refusing to participate in a fraud, essentially. That’s our view of it. But Polley countered that Dr. Steinnagel had received a forwarded e-mail from WHCS president Yvonne Chan on April 2, stating that WHCS was terminating her employment at the WSIB’s behest. Employment lawyer Greg McGinnis, who is defending WHCS in the suit, told COHSNthat he believed Dr. Steinnagel’s accusations of improper conduct to be “without merit.” He added that he had filed a pleadings motion to have some of her claims struck from the case. “We have taken the view that many of her claims are not properly pleaded and don’t actually belong in the claim,” said McGinnis, who practises with Toronto law firm Mathews, Dinsdale & Clark. “We acknowledge that she is making a claim for wrongful dismissal and that there’s a lot of extraneous noise surrounding that particular claim.” The WSIB has filed a similar motion on their part, he added. The defendants’ pleadings motions will be heard in court on Oct. 26, with the lawsuit itself likely following in November. Polley speculated that this type of alleged fraud may be a problem with the workers’ compensation system overall. “What we’re hearing is that this is a more widespread issue than just this one case,” he said. 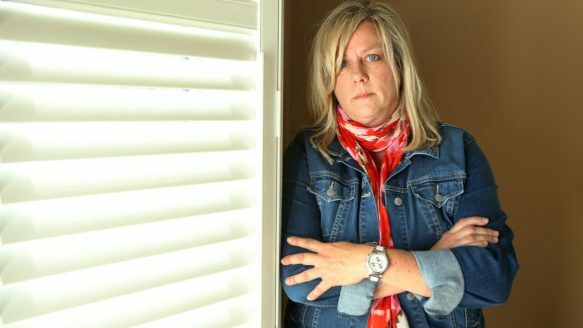 Dr. Brenda Steinnagel, photographed at her home in Ontario on Sept. 22, is suing her former clinic and the WSIB for wrongful dismissal, alleging the WSIB pressured her employer into firing her when she refused to provide a medical opinion on a claimant that the WSIB would agree with. 1) Let’s talk about Dr. Brenda Steinnagel who, after filing a report that the WSIB did not agree with, was told by the WSIB to change her report not once but several times. When she refused the WSIB arranged for her dismissal. Fraud or something like it by the WSIB has robbed Dr. Steinnagel of her job and a worker of the life he knew. Minister Flynn please demonstrate support for workers by coming to the Injured Workers Monument (beside the Hoito) at 1:00 pm Monday, December 14th. 2) Let’s talk about the Ontario Worker Adviser program that the government claims is providing support to Injured Workers that are fighting through a very complicated appeal system. But the Thunder Bay Worker Advisor’s office has been turning people away for months because they have a two (2) year backlog of claims. We call this the Ontario Government’s and WSIB’s unofficial “Barriers till You Give Up Program (BYGUP)”. This failure of the Workers Advisors program is fraud or something like it that is frustrating legitimate Injured Worker Claimants to the point where they give up before receiving the benefits they are entitled to. Show your support and come to the Injured Workers Monument located beside the Finish Labour Temple. We will march to Michael Gravelle’s office. 3) Let’s talk about the Experience Rating program which rewards employers with the lowest monetary claims to WSIB and punishes those with the most. Suppressing Injured Workers Claims is easier for employers and the WSIB than fixing unsafe working conditions. For WSIB to suggest that Experience Rating is for any other purpose then to save them money is beyond belief. The Experience Rating Program is fraud or something like it solely designed to prevent workers from obtaining the money to which they are entitled. Join Thunder Bay’s Injured Workers and their Families as they fight to stop WSIB’s fraudulent behaviour. Finn Hall – Bay St. – Injured Workers Memorial.